I have been making these step stools for a little while. Someone asked me If I would make one for them and so I did. After making one I took a pic and posted it to our Facebook page and out of all of the things I have on that page to sell this has been the most popular. I would have never had guessed that this item would be my best. I usually just make things that I want and then post them to the page and see if anyone would like them. Lately, after getting better with Sketch Up, someone will ask about something and I make a model for them which allows them to get a better feel if they would like to buy. I do not know how well this works because it has only gotten me two sales. I think if I could render the models in a real life setting this would help sell a lot more product. Getting back to the step stools. I am very amazed at how popular they have become. Something as simple as a step stool that people can buy for the same price at the store. I usually look at it like that. I will see a popular item and try and figure out how I can build it better for the same price or build it the same for cheaper. Not a very easy thing to do in this Wal-Mart world we live in these days. I am not a big fan of this store and really shouldn’t even mention there name. It feels sacrilegious to me even to go there let alone buy anything. They can sell stuff so cheap that there is no way to compete. People have gone away from getting a quality item. I believe they would rather just replace it instead of get something that would last a long time. They want to constantly buy things so to buy a piece of furniture that will last a lifetime seems boring to them. Well that is a rant now isn’t it! I will get off my high horse and get back to what the whole post is about. 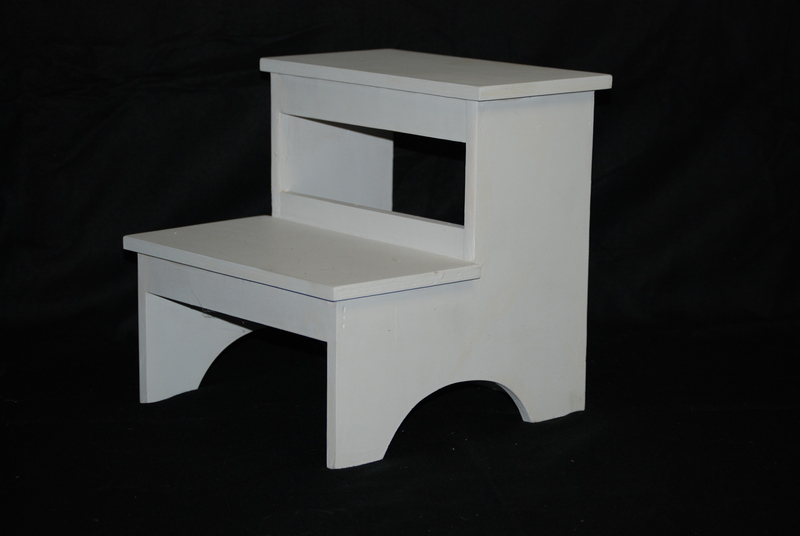 The step stool is my best seller and I would never had guessed is the point. If I wouldn’t have stumbled across it I would have never thought to build one for anyone. That there was a need. So I am on the lookout for the next best seller because I do not make enough money off of them. I use it as something to show people you can trust us to get it done when we say we are going to and other people trust us to do so. In other words someone else is their guinea pig. I was thinking of a flip step stool because there has been some interest by adults asking if the stool would support there weight. I wouldn’t trust it even though it would but I think it to small for a balance factor. The taller person would have a different center of gravity point and the stool would be more prone to tipping if the weight was shifted to far either way. this I know because I tested it myself before committing to a customer. I tried to push them to a larger one but the expense dissuaded them I think.